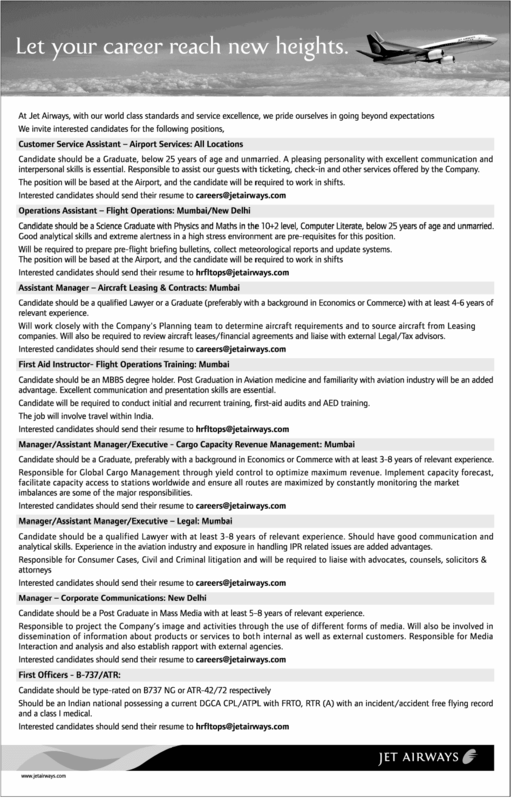 At Jet Airways, with our world class standards and service excellence, we pride ourselves in going beyond expectations We invite interested candidates for the following positions. interpersonal skills is essential. Responsible to assist our guests with ticketing, check-in and other services offered by the Company. The position will be based at the Airport, and the candidate will be required to work in shifts. Candidate should be a qualified Lawyer or a Graduate (preferably with a background in Economics or Commerce) with at least 4-6 years of relevant experience. Will work closely with the Company's Planning team to determine aircraft requirements and to source aircraft from Leasing companies. Will also be required to review aircraft leases/financial agreements and liaise with external Legal/Tax advisors. Candidate should be an MBBS degree holder. Post Graduation in Aviation medicine and familiarity with aviation industry will be an added advantage. Excellent communication and presentation skills are essential. Candidate will be required to conduct initial and recurrent training, first-aid audits and AED training. The job will involve travel within India. Candidate should be a Graduate, preferably with a background in Economics or Commerce with at least 3-8 years of relevant experience. Responsible for Global Cargo Management through yield control to optimize maximum revenue. Implement capacity forecast, facilitate capacity access to stations worldwide and ensure all routes are maximized by constantly monitoring the market imbalances are some of the major responsibilities. Candidate should be a Post Graduate in Mass Media with at least 5-8 years of relevant experience. Responsible to project the Company's image and activities through the use of different forms of media. Will also be involved in dissemination of information about products or services to both internal as well as external customers. Responsible for Media Interaction and analysis and also establish rapport with external agencies. Candidate should be type-rated on B737 NG orATR-42/72 respectively. Should be an Indian national possessing a current DGCA CPL/ATPL with FRTO, RTR (A) with an incident/accident free flying record and a class I medical.